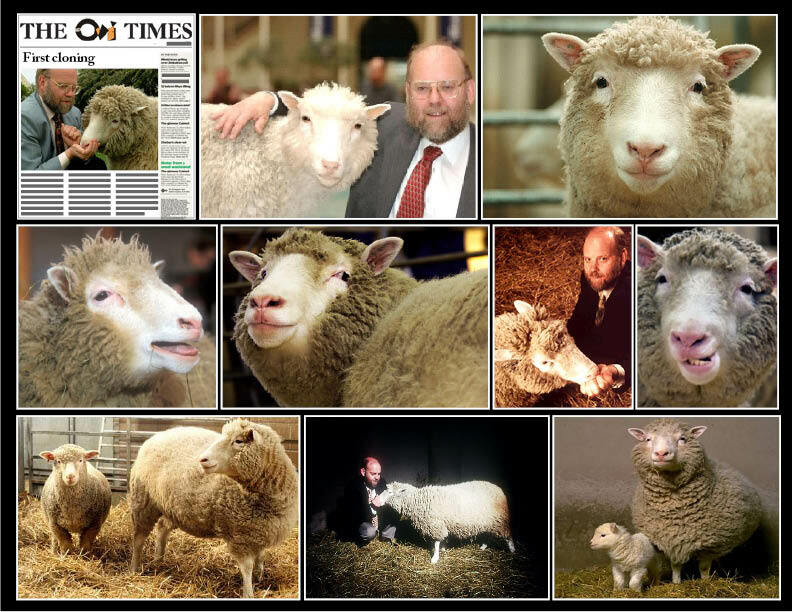 July 5th 1996, Dolly the sheep--the first mammal to have been successfully cloned from an adult cell--is born at the Roslin Institute in Scotland. Originally code-named "6LL3," the cloned lamb was named after the buxom singer and actress Dolly Parton. The name was reportedly suggested by one of the stockmen who assisted with her birth, after he learned that the animal was cloned from a mammary cell. The cells had been taken from the udder of a six-year-old ewe and cultured in a lab using microscopic needles, in a method first used in human fertility treatments in the1970s. After producing a number of normal eggs, scientists implanted them into surrogate ewes; 148 days later one of them gave birth to Dolly. Dolly's birth was announced publicly in February 1997 to a storm of controversy. On one hand, supporters argued that cloning technology can lead to crucial advances in medicine, citing the production of genetically modified animals to be organ donors for humans as well as "therapeutic" cloning, or the process of cloning embryos in order to collect stem cells for use in the development of treatments for degenerative nerve diseases such as Alzheimer's and Parkinson's. Some scientists also looked at animal cloning as a possible way to preserve endangered species. On the other hand, detractors saw the new cloning technology as potentially unsafe and unethical, especially when it was applied to what many saw as the logical next step: human cloning. Over the course of her short life, Dolly was mated to a male sheep named David and eventually gave birth to four lambs. In January 2002 she was found to have arthritis in her hind legs, a diagnosis that raised questions about genetic abnormalities that may have been caused in the cloning process. After suffering from a progressive lung disease, Dolly was put down on February 14, 2003, at the age of six. Her early death raised more questions about the safety of cloning, both animal and human. Though Ian Wilmut, the lead scientist on the team that produced Dolly, has spoken out publicly against human cloning, its supporters are unlikely to be dissuaded. As for Dolly, the historic sheep was stuffed and is now on display at the National Museum of Scotland in Edinburgh. Scientific progress, no doubt, but the ethical issues remain; issues that science is not well equipped to deal with. The manipulation of genes which has taken millions of years to evolve may be a new example of the hubris of man. One can well imagine what the Nazi doctors would have done with the cloning technology... and they would have called it progress.